Kristof Vandewalle (Omega Pharma-Quick Step) won the Belgian time trial championships in Eau d'Heure, in the east of the French-speaking Walloon region of the country. The 27-year-old from Kortrijk completed the 41.4km course - made up of three 13.8km laps of the lake - in a time of 56 minutes and seven seconds, to finish 48 seconds quicker than Ben Hermans (RadioShack-Nissan), who took a second straight silver medal. Defending champion Philippe Gilbert (BMC Racing) took the bronze medal, a minute and nine seconds behind Vandewalle, meaning that the most dominant rider of 2011 remains winless in 2012. "It's a great day for me," said Vandewalle. "I was looking forward to this race. I trained a lot in the last week to be competitive here, and in the upcoming races. “Yesterday I did a recon of the parcours, and I had a feeling it could be a good track for me. There were a lot of uphill sections where you had to use the small gear, and keep a good rhythm. So today, I did it. “The goal was to take a place on the podium,” he explained. “It was even better then I expected! It's my first victory of the season, after a first part of the year with a lot of problems due to a virus. Since July at the Tour of Austria, things changed. I was second in the TT there. This year I feel really good in the Time Trial and I have good sensations each time I jump on my Specialized TT bike." Vandewalle’s previous best in the country’s battle against the clock was his fourth place in 2008. Since then he has finished fifth, sixth, and then eleventh last year, and so can hardly believe that he has taken the driekleur jersey this time. Omega Pharma-Quick Step’s clothing manufacturer Vermarc Sport has just three days to make Vandewalle a black, yellow and red skinsuit, which he will wear in Saturday’s Pamplona team time trial. “Today Kristof had a great race" said Sports Director Rik Van Slycke, who followed Vandewalle in the team car during the event. "He immediately started very well. We had the reference time of Julien Vermote and Guillaume Van Keirsbulck, but since the beginning Kristof was flying on the parcours. 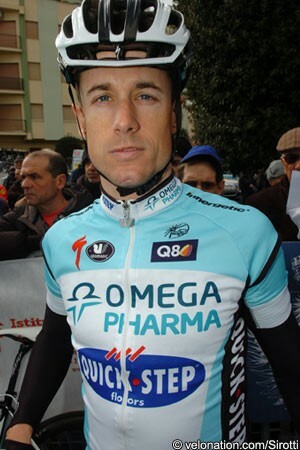 Vandewalle’s national title is the ninth held by Omega Pharma-Quick Step. The Belgian team also holds its national road race title through Classics king Tom Boonen, as well as the Dutch, Polish and Irish road titles through Niki Terpstra, Michal Golas and Matt Brammeier. The team also holds national time trial championships from France, Italy, Slovakia and Germany, through Sylvain Chavanel, Dario Cataldo, Peter Velits and Tony Martin; Martin, of course, has yet to be seen in his German skinsuit however, since he is also the reigning World champion. In the women’s race Liesbet De Vocht (Rabobank) successfully defended her title, taking her third title in four years. The 33-year-old from Turnhout, near Antwerp, completed the two-lap, 27.6km course in a time of 44 minutes 51 seconds; beating Lotto-Belisol duo Sofie De Vuyst and Ann Sophie Duyck by 20 and 40 seconds respectively.